It’s the 17th and this is your reminder to do your breast self-exam! And remind your sistahs too! Cas-ual Fridays is donating 50% of the profits from this collection to National Breast Cancer Foundation to support their awareness and research programs. I think that is AWESOME!!! Next on the hop is the talanted Kristie Goulet, hop on over and give her some love! If you want to start from the begining, hop on over here. This entry was posted in Uncategorized on May 17, 2016 by Joanna Harty. You’ve added some cool texture to your card without adding too much bulk. I love cards like these. Thanks for the inspiration and reminder, Joanna! Great card for this awesome hop, Joanna!!! I love the simple design. It makes the message jump out and take front and center. Beautiful design and card. I love how you put the black paper behind the sistahs and girl to make it stand out more! Great card! I love how you offset Sistahs and Girl! Gorgeous card! Perfect sentiment for the hop, beautiful card!! Scoring is a great way to add without distracting. Awesome card! Love the bold dimension! This is fantastic!! 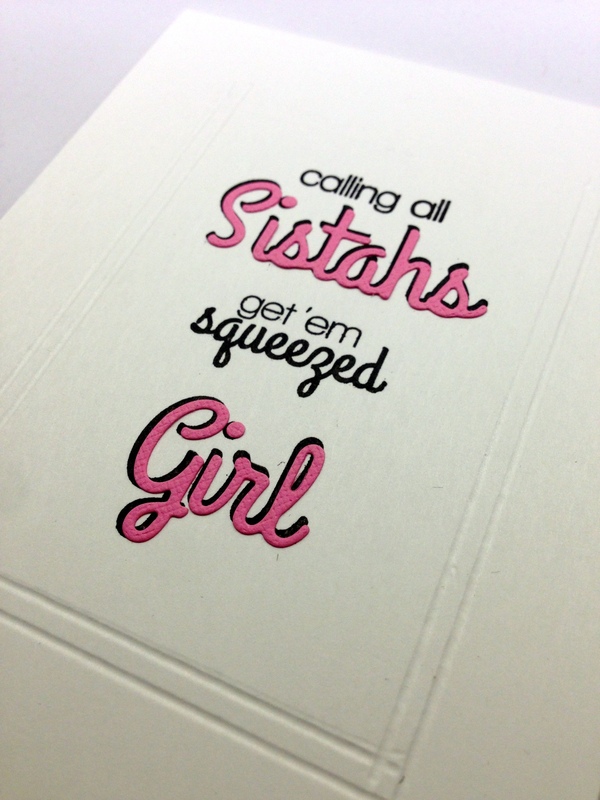 Love how you combined the sentiments and great use of those dies cuts and score lines! love the simple design, fabulous card! A fun way to tell someone to go do her breast exam. that’s my kind of card. Oh boy I really like your offset sentiment! Great hope inspired card and cause! What a fun card! Love that debossed frame you made around the sentiment, too! Great card with a fun sentiment for an important cause. Amazing design!! I love the embossed lines on the side! !